Surprisingly, Olympus have just mothballed the E-P1. Welcome, the E-P2. (It’s as if Olympus sent out the E-P1s and then realised the factory had missed off a few things.) Aside from a couple of fancy and useful-looking focussing features, the major upgrade is the addition of a port on the back, just below the hot-shoe, that enables plug-in gadgets such as the new, included, digital external viewfinder (shown above, top), which can be used at any angle up to 90 degrees, and an off-camera microphone for use while shooting video (at up to 720p). 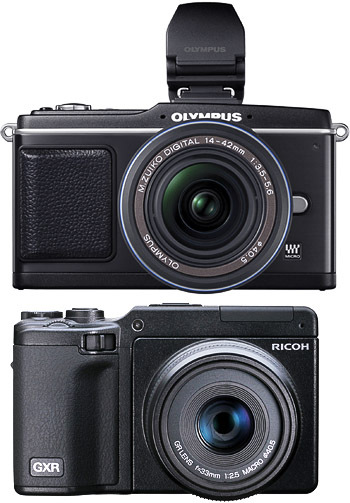 In other camera news, Ricoh have thrown the baby out with the bathwater and developed the GXR (above, bottom). It’s a wacky (if not entirely new) concept and no mistake: whereas cameras like the E-P2 allow lens changes the old fashioned way, Ricoh’s new creation has you slide off half the camera to get different optics. The lens, the sensor and half the image processing clobber comes off in one dust-defying unit, leaving you holding the grip, display, battery, card, some chips and buttons ready to slot in another lens unit. Ricoh claim that this approach will enable them to optimise each sensor to the lens and its intent. Sorry, Ricoh. If you’re going to think outside the box, make sure that box really needs to be thought outside of. Olympus gets the “goodstuff” badge.